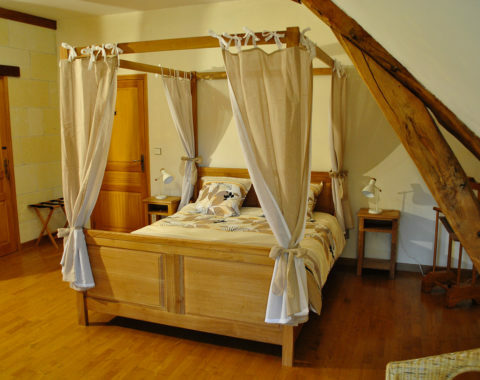 The guest rooms are all on the 1st floor of what was once used as a barn above the family house. 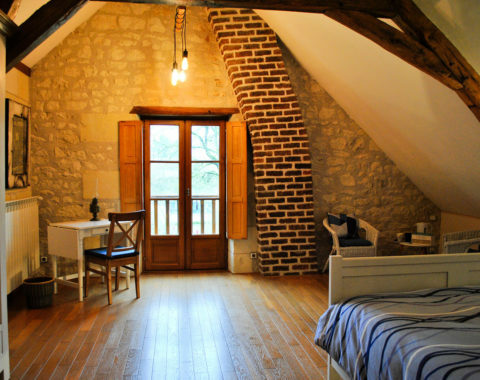 Now you will not lack in comfort; rather, you will feel enchanted by the beautiful oak rafters, parquets and indoor shutters, in a lovely contrast with the original white Tuffeau stone walls. During WWI, on these walls, U. S. soldiers (placed in barns and attics for makeshift housing), engraved their names and addresses, leaving a last souvenir of their presence in Noyers sur Cher during this historic, traumatic period.